Auctions In Motion ring man Matt Klein accepts a bid during one of the company's auctions in Southern California. The company typically offers 125 to 150 used vehicles and draws about 100 to 125 potential buyers. Tony Fiori used to drive 130 miles to an auction when he wanted to wholesale used vehicles. Now the auction comes to him. Vista Honda in Ventura, Calif., where Fiori is a vice president, is one of more than 200 Southern California dealerships that consign their vehicles to Auctions In Motion, an auction company that holds its sales in dealerships' back lots or neighborhoods. For instance, Auctions In Motion sells Fiori's excess used vehicles at the Ventura Auto Mall, the site of his dealership. Fiori says Auctions In Motion sales are close, convenient and less expensive than traditional auctions. About once a month, he still travels two hours to a traditional auction, but only to buy used vehicles. "The nearest [large] auction is well over 100 miles away," says Fiori, who is in charge of buying and selling used vehicles for his dealership. "I'd have to leave at 5:30 a.m. to get there by 8 a.m., and cars start running like 9-9:30 a.m. Depending on what line I'm in, my cars might not run until 1 o'clock in the afternoon. It can be an all-day event. "With Auctions In Motion, I leave 20 minutes before auction time and I'm back in my office within an hour and a half doing my day's business." Auctions In Motion is the brainchild of CEO George Pero, who started taking auctions to dealers in Southern California in 2006. Pero began taking sales to dealers in 2006. At first, Pero and his staff worked out of trailers and tents on dealership lots. Since then, three of the four weekly auctions have moved to buildings near major auto malls. Only the Ventura sale operates from trailers on the property of Paradise Chevrolet at the mall. Pero has an agreement with Norwalk Auto Auction in Norwalk, Calif., to process titles and cash checks. Manheim provided those services from June 2006 to February 2009, he says. 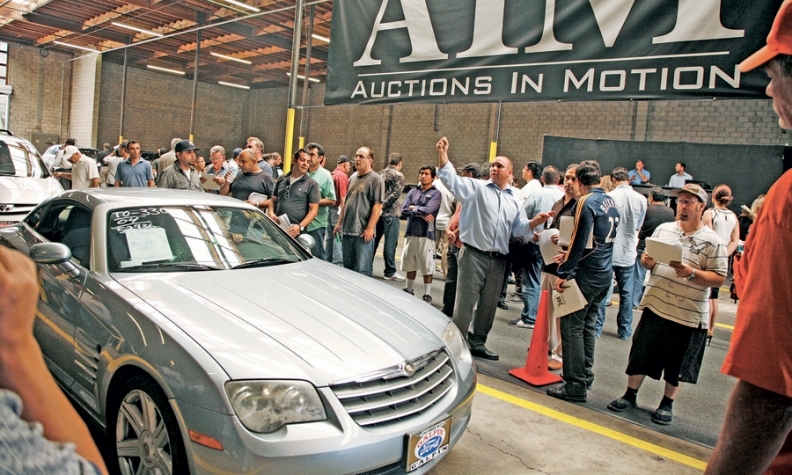 Unlike large auction sites where sellers offer thousands of vehicles to hundreds of buyers, each Auctions In Motion sale typically offers 125 to 150 used cars and trucks and draws about 100 to 125 potential buyers. Buyers represent franchised dealerships, independent used-car lots and wholesalers. With fewer bidders pushing up prices, sellers risk not getting as much for each vehicle. But low fees and other costs make up for some of that, and dealers say they're satisfied with the results. Dealers pay $195 to sell a vehicle; buyers' fees vary with vehicle prices but average around $250. "We only get paid when we sell a car," Pero says. Fiori says the buyer fee on a $15,000 vehicle at a traditional auction typically runs $350 to $450. Seller fees depend of the price of the vehicle and generally average around $325, another auction buyer says. Pero's sales are growing but still tiny compared with the millions of vehicles handled each year by large auction companies. In 2011, Auctions In Motion sold 12,012 vehicles on consignment, up from 8,994 in 2010 and 4,175 in 2009. First-quarter sales this year rose 35 percent to 3,847 from the year-earlier level. The company holds four sales a week, one each in Ventura, Santa Ana, Thousand Oaks and Pasadena. Ventura tends to specialize in vehicles priced under $10,000; the others sell vehicles priced at as high as $40,000 and more, Pero says. Pero says Auctions In Motion helps arbitrate buyer-seller disputes, but few have occurred. The auction's small size allows buyers and sellers to know one another, which helps when disputes arise. To help build relationships, Pero offers a free catered lunch before each sale. Scott Stanley, general manager of Honda of Thousand Oaks, says he used to have a lot of arbitrations when he sold his vehicles at traditional auctions. "Now, we don't have that many arbitrations and if I do have one, there's an attitude of, 'Let's work it out,'" Stanley says. He sells about 50 to 70 used vehicles a month at Pero's auctions. "That is a huge source of pain and frustration at other auctions." 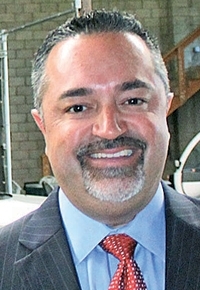 Keith Goldberg, general manager of Rusnak Porsche Westlake, in Thousand Oaks, says he sells vehicles at Auctions In Motion two or three times a week. He says its rates are reasonable and he likes the close-knit relationship among buyers, sellers and Pero's staff. "When you go to the large auction houses," he says, "nobody knows who you are."